Best guide experience ever! Rui is a native Azorean with intimate knowledge and love of his island culture. He's very friendly and fun and was eager to tailor the tour to our interests. His insight into the tourist patterns enabled us to beat the crowds and maximize our time and enjoyment of each location. I was completely pleased with our recent tour by Rui. What an outstanding tour guide he is! He was very responsive ahead of the tour, reviewed alternatives for us on the day of the tour, and was very concerned about showing us exactly what we wanted to see. My only regret is that we did not book Rui for two days! I highly recommend his tours and have given his name to several of my friends. He is a treasure! Rui was absolutely wonderful. He is knowledgeable and welcoming and has a fabulous sense of humor. He was also very accommodating in working with us and what we were interested in seeing or not seeing. Had Rui 2 days in a row. Just as FANTASTIC the second day. He made me fall in love with the island as much as he is in love with it!!!! Absolutely FANTASTIC!!!!!! Our guide was the best. He was very clear in explaining everything. Did not rush us. Very well spoken. I felt like I was with a family member. You could tell he loves his island. Ruiz was fabulous, very knowledgeable, perfect English. He did just what we wanted for a tour, perfectly planned. Rei was fantastic! We had an interesting trip with him and want to return to the Azores. It is a beautiful island and although we only had a day, felt we were better informed. Rei knows the history,past and present, and was a delight and honor to have him as a guide. We recommend him highly. Rui did a great job on our tour! Very knowledgable! We just had a few hours in Ponta Delgada for a layover and wanted to make the most of our time there. We are so glad we did a tour! Definitely recommend! excellent guide and driver, curteous and attentive to specific needs of our group - well-planned route and abundant economic, social and historical information - highly recommend! Another great full day tour. The tour was altered to suit our needs and Rui did a fantastic job to make sure we saw as much as possible. His knowledge of the island and the people add to the experience! 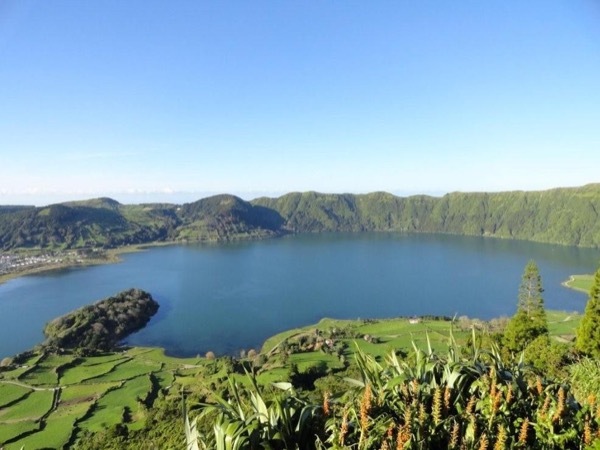 We would recommend him to anyone wishing to tour São Miguel. Rui was an excellent guide. Our tour was modified to give us more time at Parque Terra Nostra and Nordeste. We could not have had a better trip to this part of the island! It was a delightful day in every respect. Where do I start? The tour was amazing and our tour guide, Rui, was absolutely splendid. He went out of his way to accommodate our group which included my 7 & 6 year daughters as well as my sister-in-law all three of whom who don't speak Portuguese. Rui was so informative about the island, the people, the culture and traditions. While I had previously been to the island of Sao Miguel I learned so many things with Rui that I had never heard about.He made our day in Sao Miguel a gem. Rui was absolutely wonderful!!! He was warm, informative and had a great sense of humour! I would recommend him as a tour guide and the next time I visit Portugal I would certainly have him be our tour guide again!!! Rui provided us with a wonderful day in Sao Miguel. He customized the tour to visit Ponta Garca and find the house in which my grandfather was born. It was an exciting experience, I would recommend him. He's courteous, helpful and knowledgeabe. Was a fabulous tour, our guide was very knowledgable. Restaurant was superb, I would highly recommend this tour and guide! exceeded our expectations! Rui was very flexible with changing the itinerary and his English was excellent! I was travelling with my mother, son and niece and he was able to keep us all interested and we would definitely recommend his services! Since Rui was busy on April 24, 2012 he recommended his colleague Carlos to be our guide for this wonderful tour. Carlos was an amazing tour guide, his English was fluent (as he spent many years in Toronto, Canada). Besides having an amazing knowledge on Azores and Ponta Delgada, Carlos had excellent time management skills and looked after all our needs in a very professional manner. We would highly recommend Carlos as a tour guide. Also, we had a brief chat with Rui and found him very professional. TOURSBYLOCALS RESPONSE: Rui and Carlos work together - the substitution was agreed to by the customer.